Our annual Jack and Jill Day is a day of fun for the entire family. In September, we celebrate a new program year and new beginnings. Plus, we pay special tribute to Carole Robertson, one of the four little girls that died in the Birmingham church bombing on September 15, 1963. 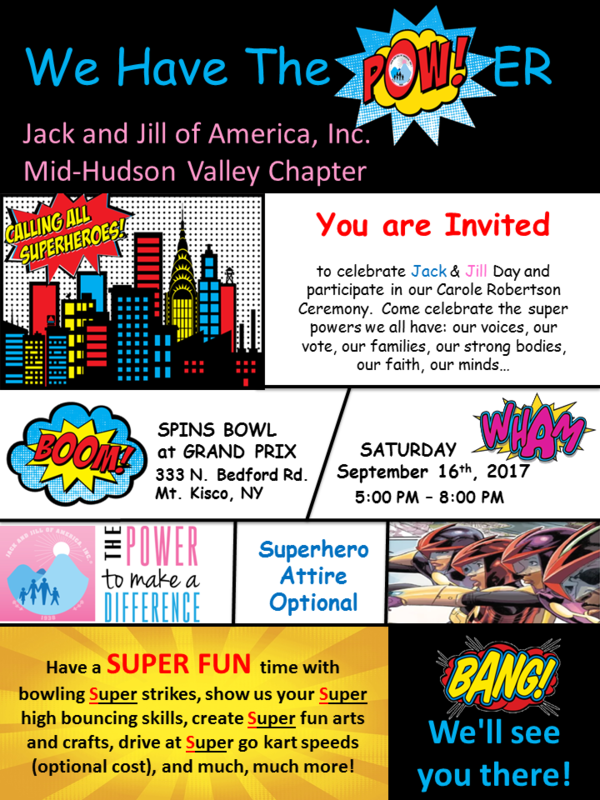 The Jack and Jill Day Committee invites all MHVC families, friends and the extended Mid-Hudson Valley community to join us at an Super 2017 Jack and Jill Day celebration! Spend the evening having fun bowling while reconnecting, enjoying prizes and surprises, eating and experiencing a meaningful remembrance of our history in the teens' Carole Robertson presentation. Let's start the 2017 Program Year off right by coming together to participate in this fun activity! We'll see you there!